Today, some astronomers prefer to refer to Star A as HD 75289, as it is listed in the Henry Draper (1837-82) Catalogue with extension (HDE), a massive photographic stellar spectrum survey carried out by Annie Jump Cannon (1863-1941) and Edward Charles Pickering (1846-1919) from 1911 to 1915 under the sponsorship of a memorial fund created by Henry's wife, Anna Mary Palmer. As a relatively bright star in Earth's night sky, Star A is also catalogued as Harvard Revised (HR) 3497, a numbering system derived from the 1908 Revised Harvard Photometry catalogue of stars visible to many Humans with the naked eye. The HR system has been preserved through its successor, the Yale Bright Star Catalogue -- revised and expanded through the hard work of E. Dorrit Hoffleit and others. On the other hand, Star A has an older designation as CD-41 4507, from a visual survey of southern stars begun in 1892 at the Astronomical Observatory of Cordoba in Argentina under the direction of its second director John M. Thome (1843-1908). Thome died before the completion of this southern sky atlas in 1914, when 578,802 stars from declination -22° to -90° were published as the Cordoba Durchmusterung ("Survey"). The "CD" is an extension of an older catalogue by Friedrich Wilhelm August Argelander (1799-1875) in 1863 on the position and brightness of 324,198 stars between +90° and -2° declination that were measured over 11 years from Bonn, Germany, made with his assistants Eduard Schönfeld (1828-1891) and Aldalbert Krüger (1832-1896), which became famous as the Bonner Durchmusterung ("Bonn Survey") abbreviated as BD. The BD and CD were greatly expanded and extended into the modern age of photographic surveys with the subsequent creation of the Cape Photographic Durchmusterung from South Africa. HD 75289 A is a yellow-orange main sequence dwarf star of spectral and luminosity type G0 V (Gratton et al, 1989), but it had been previously classified as bright as a supergiant (Ia) or a hypergiant (O) possibly because it was thought to be much further away. 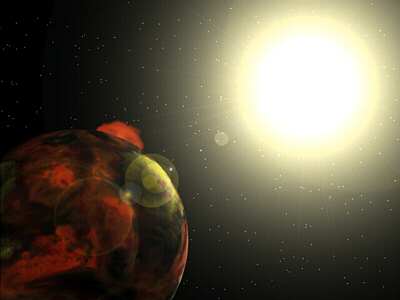 The star has about 1.05 times the mass of Sol (HD 75289 at the Observatoire de Genève), probably a greater diameter, and twice (2.01) its visual luminosity. 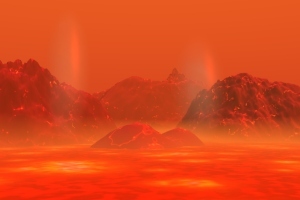 Relatively bright for its spectral type and mass, it appears to be running low on core hydrogen despite being around Sol'age -- around 4.6 billion years (press release; and Henry et al, 1996). HD 75289 A is about twice (1.90-1.95) as enriched than Sol with elements heavier than hydrogen ("metallicity"), based on its abundance of iron (HD 75289 at the Observatoire de Genève; Gonzalez and Laws, 2000; and Gratton et al, 1989). According to the Astronomiches Rechen-Institut at Heidelberg's ARICNS, it may be an RV variable. Useful catalogue numbers and designations for this star include: HR 3497, Hip 43177, HD 75289, CD-41 4507, CP(D)-41 2972, SAO 220481, and LTT 3243.
around host star HD 75289.
could be an extremely hot, rocky superplanet. 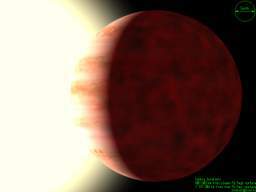 In May 1999, astronomers (including Michel Mayor, Didier Queloz, Stephane Udry, Dominique Naef, Nuno Santos; Claudio Melo; and B. Confino) announced the discovery of a Jupiter-class planet around HD 75289 using radial-velocity methods (Udry et al, 2000, in ps; press release; summary data at the Observatoire de Genève; and HD 75289 at exoplanets.org). Planet "b" has at least 44 percent of Jupiter's mass. It moves around HD 75289 at an average distance of only 0.05 AUs (a semi-major axis well within Mercury's orbital distance) in a highly circular orbit (e=0.04) that takes only 3.5 days to complete (HD 75289 at exoplanets.org). Assuming a Jupiter-like composition, its radius may be about 1.2 times that of Jupiter, enlarged relative to Jupiter because of greater absorbed stellar radiation in its inner ("torch") orbit. However, like 51 Pegasi b, the planet may be too hot to hold onto a thick hydrogen atmosphere (discussion). planet with a dense atmosphere. According to astronomer Jim Kaler, HR 3497 has a red dwarf companion at a separation of at least 620 AUs. It has around 14 percent of Sol's mass and takes around 13,000 years for a complete orbit around its common center of mass with Star A. Although no visual magnitude measurement was available, Professor Kaler estimated that Star B probably has around 0.5 percent of Sol's luminosity and would only be as bright as the planet Venus from planet b. The following table includes all star systems known to be located within 10 light-years (ly), plus more bright stars within 10 to 20 ly, of HD 75289. Try Professor Jim Kaler's Stars site for other information about the HR 3497 AB system at the University of Illinois' Department of Astronomy. The late John Whatmough created illustrated web pages on this system in Extrasolar Visions. Up-to-date technical summaries on this star can be found at: Jean Schneiders's Extrasolar Planets Encyclopaedia; and the Astronomiches Rechen-Institut at Heidelberg's ARICNS. Additional information is available from www.alcyone.de's entry for HR 3497. A large constellation of the Southern Hemisphere, Vela forms the Sails of the even larger, ancient constellation of Argo Navis, the ship of the Argonauts, which also included Vela's sibling constellations of Carina, Puppis, and Pyxis. Vela has no stars labelled as Alpha or Beta because the brightest stars of the older constellation were allocated to its siblings. For more information about the stars and objects in this constellation and an illustration, go to Christine Kronberg's Vela. For an illustration, see David Haworth's Vela.